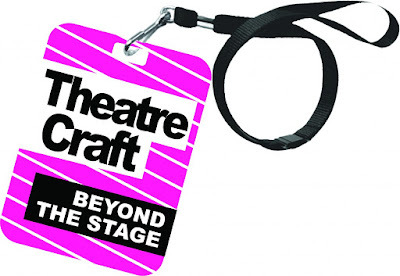 The free annual TheatreCraft careers event is the biggest non-performance careers event in London. Taking place in the beautiful Waldorf Hotel and with workshops going on in a number of nearby West End theatres, there is no doubt that all those who attend leave feeling inspired by the electric atmosphere of theatreland, as well as the unbridled enthusiasm exuded by the theatre professionals who give up their time to come and talk to young arts enthusiasts. This year's TheatreCraft was bigger and better than ever, with loads to be getting on with throughout the day. 2016 TheatreCraft ambassador Adam Kenwright from ATG launched the event at 10am with a passionate speech wherein which he outlined his own career history and touched upon the importance of young people in the industry. He urged everyone to ask 5 questions every day, before sending us on our way. The TheatreCraft marketplace was bustling with hundreds of young and excitable theatre enthusiasts making the most of the sheer variety of theatres and education providers exhibiting in the hall. I spoke to many different companies and organisations throughout the day, and picked up loads of different flyers and information sheets too. It was particularly useful to be able to ask the people manning the stalls about their own jobs and how they got to be where they are now, and as a result I was also able to gather lots of information about a variety of work experience opportunities and internships too. All in all a very productive perusal! The wealth and variety of different workshops was also someone overwhelming. No matter which area of theatre was of interest, there was a relevant workshop for it. I personally attended two workshops, the first of which was entitled Learn How To Market A Show From Scratch with Dewynters, a world leading arts and live entertainment marketing company. The workshop began with a tour around the different departments at Dewynters. 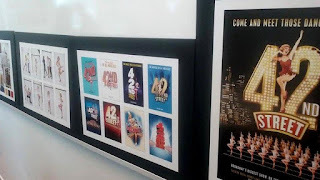 We got a glimpse into the inner workings of the company, and saw loads of different examples of marketing materials produced by Dewynters for a myriad of past and current West End shows! We were then taken through the creation of a logo/poster for a West End show, using the upcoming 42nd Street revival as an example. It was exciting to see each step in the process, from mood board to finished product, and what a beautiful finished product the 42nd Street logo is! Who else is excited for that show to hit London next March? After the talk was over, we were split into smaller groups and invited to plan a marketing campaign for a fictional upcoming musical named Downton The Musical! My group was in charge of the Audience element, and so we mind mapped ideas about which demographic would be most likely to book tickets to Downton The Musical, and how we could entice different audiences in too. The activity was brilliant fun, and by the end of the session we'd managed to plan the beginnings of what looked like a pretty brilliant marketing campaign! Honestly, I didn't want to leave the session at the end. The Dewynters office was very swanky and the staff who led our workshop were so knowledgeable that I'd have liked to pick their brains some more, but we had to leave because there was so much more to explore at TheatreCraft, and I personally had another workshop to attend. The second workshop I attended was called Critical Condition - Is There A Future In Theatre Reviewing? This workshop was led by freelance theatre critic Tom Wicker, whose writing has featured in many different publications both in print and online. He had lots to say about the future of theatre criticism, and the way in which it must change and evolve in order to keep up with today's shift towards digital as the norm. He spoke in praise of the younger writers at publications like The Stage, and also expressed a wish to see more reviews written by non white, male, middle class critics. I was also thankful to hear him encourage young aspiring critics to start their own blogs, contribute to pre-existing theatre review sites or write for their school or university newspapers, as in the past some professional critics have been rather scathing about the criticism produced by bloggers. I came away from the session feeling refreshingly positive about the state of theatre criticism and its future. It's certainly got a lot of updating to do, but there's no way good quality criticism is going to die out anytime soon. If nothing else, the amount of people in attendance at the workshop proved that a hunger for quality criticism is very much alive within younger theatregoers. 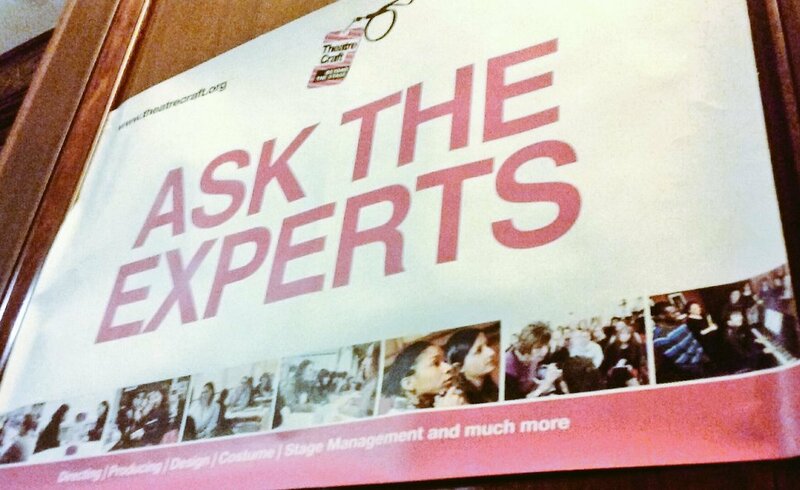 However, perhaps the most valuable part of TheatreCraft was the one to one Ask The Experts sessions, which took place throughout the day. Demand for spaces was high, and for good reason. TheatreCraft attendees were given to opportunity to have their CV checked over by a theatre professional from within their chosen section of the industry, an invaluable opportunity, especially for those about to graduate from college or university. My Ask The Experts session was arts marketing and PR expert Ryan Grimshaw, the marketing coordinator for Pavilion Dance South West. I was given loads of brilliant advice about what else I could do to make my CV stand out, as well as suggestions of further training opportunities and work experience advice. I was thankful for the opportunity to be able to pinpoint exactly which skills I needed to develop. Having a CV looked over by a careers adviser at school or university is useful of course, but having it critiqued by an expert in the field I hope to work in is an unparallelled opportunity. Evidently TheatreCraft is an unmissable event for anyone thinking about a career in the arts. The chance to get stuck into a wide array of workshops as well as chat and network with theatre industry professionals is an opportunity like no other. Follow TheatreCraft on twitter (@theatrecraft) for more information about the event, as well as a heads up when the 2017 event is announced. Many thanks to Theatre Bloggers for securing me a press pass so that I could cover the event in more detail.